Hair Growing Light Angel, Personal Pore Care Beauty Equipment - High quality Taiwan Hair Growing Light Angel, Personal Pore Care Beauty Equipment provides by Jean-Modern's Ind. 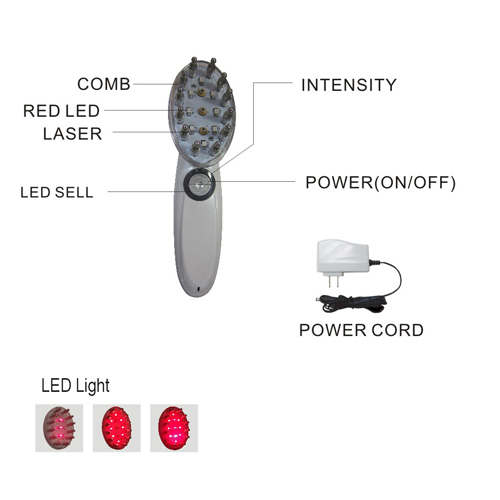 Co., Ltd.
650nm Laser Hair Growth Comb is a Hairdressing Apparatus for Hair and Scalp Care. Effectively active the atrophic scalp cells to make its BIO-Energy balanced and improve metabolism. The Scalp and Hair follicle tissue will absorb nutrition more sufficiently under the normal condition of metabolism, as a result it can promote the regeneration of hairs. This kind of Three-In-One ( Intense Pulsed Light, Laser & Micro-Current ). Hair Growth Comb adopts nourishing light to wash your hair root to make your hair brighter.